Restocked. "In the mid 1960s, Detroit Michigan was a thriving industrial city. It was at the edge of a cliff, however. The great ethnic diversity in the inner city was a brewing powder keg of civil unrest. This, coupled with a disillusioned population struggling to make some sense of a questionable war in the rice paddies of Vietnam, set an uneasy and troubling tempo for the future. Still, there were pockets of communities in the Detroit area where things were good and economic life was vibrant. The Grosse Pointes were such communities. It was on the outskirts of this political and racially tense era, in the affluent suburbs just outside of the city of Detroit, that Index was formed. 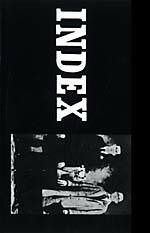 The music of Index has been lauded by music heads for decades, and with good reason: it is bizarre, atmospheric, and 'home-made' (in the best of all possible ways); the band has a druggie sound, with songs full of feedback and fuzzy guitars, hazy guitar riffs and loud rhythms. Hidden amongst the echoing canyons of sound there's some snotty post-punk attitude wrapped up in that trippy velvet fuzz; a wonderful bleak sound, both droning and murky, the atonal side of late 1960's rock that would leave the most lasting impression on those who would eventually become punk, post-punk and indie rock artists like Joy Division or the Fall. Includes a 32-page booklet, written by Index drummer Jim Valice, detailing the band's rock and roll adventures, replete with photos and lyrics; printed on FSC recycled, chlorine-free, 100% post-consumer fiber paper manufactured using biogas energy."